Desk mount for 2 LCD / plasma panels (adjustable arm), silver, screen size: 10"-24"
The NewStar desk mount FPMA-D1030D allows you to attach 2 LCD/TFT screens up to 24" on a desk. Maximum screen width is 52 cm. With this mount you can easily swivel, tilt and rotate the monitors. Each arm has 3 pivots. The height adjustment of 40 cm can be changed manually. 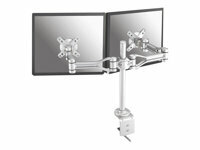 The desk mount can hold screens up to 10 kg and is attached on a desk by a clamp. Additional you can order a grommet to install the desk mount through a desk. The arm length is 56 cm. The desk mount can also be attached on a ceiling. This model is suited for all LCD/TFT screens with a VESA 75x75 or 100x100 mm hole pattern. By using an ergonomic monitor arm you prevent neck and back complaints. Ideal for use in offices, control rooms and on counters or receptions.